Back in May of this year, I stepped into the AccuQuilt booth during Quilt Market, and pitched a few of my ideas, in the hopes of working with them and their GO! products. About a month ago I was so excited to officially become one of the AccuQuilt Bloggers, and to be able to "officially" share these tutorials with you! The first tutorial in my AccuQuilt GO! series, is the Hexagon Ball. I had this grand idea when I started, and multiple times, thought it was going to be a total "craft fail"! Luckily I went with my gut feeling, and kept going. I'm not a quilter. I've made two "pieced quilts" over the last 10 years and they took me at least, 2 1/2 years to complete - each - sad right?!! I don't prefer to sew flat - but rather 3 dimensional. I like quick projects that are simple and fun, and I love being able to reuse and recycle when I can, all the while, making a gift or toy that will be enjoyed for years to come. With the AccuQuilt GO! 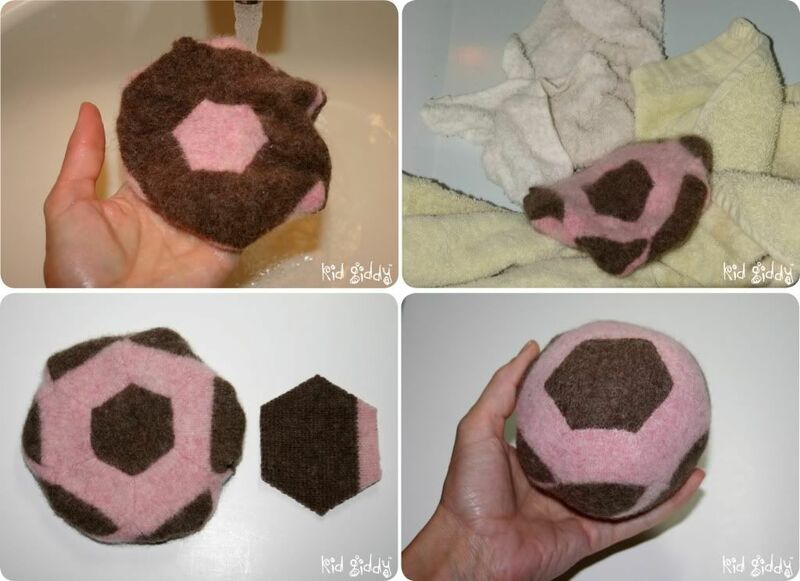 and an old wool sweater (or thrifty wool find) you can make one of the balls too with minimal effort! So grab your AccuQuilt GO! or GO! Baby and lets get makin'! 1. 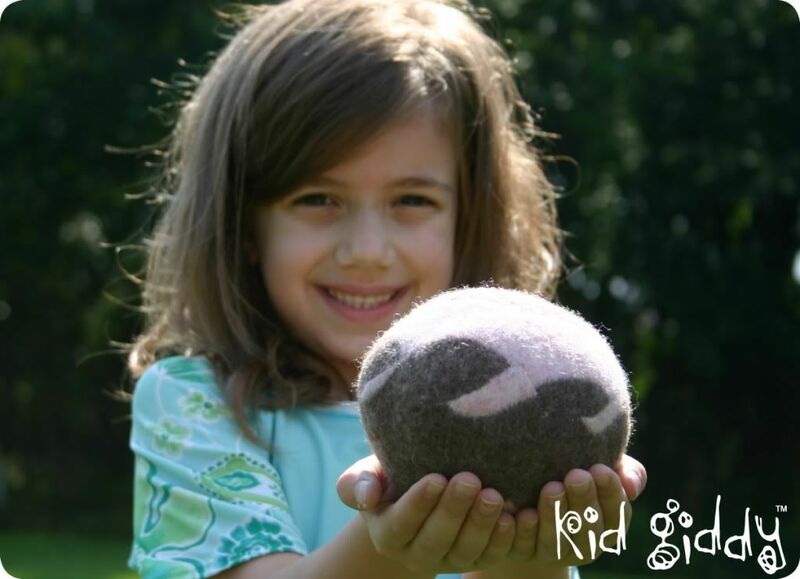 Select a 100% Wool sweater or other wool item to use for this project. Do not pre-wash (but hope it is clean enough to handle). 2. Carefully cut your wool sweater (or other wool item) apart, at the seams. Cut the arms off, the neck and waist bands, and the body. 3. Cut one of the body pieces into strips just slightly larger than the height of the hexagon size you are going to make. This ball is made using the 3" die. 4. Cut the strips into pieces to be larger than the width of the hexagon size you are going to make. 5. 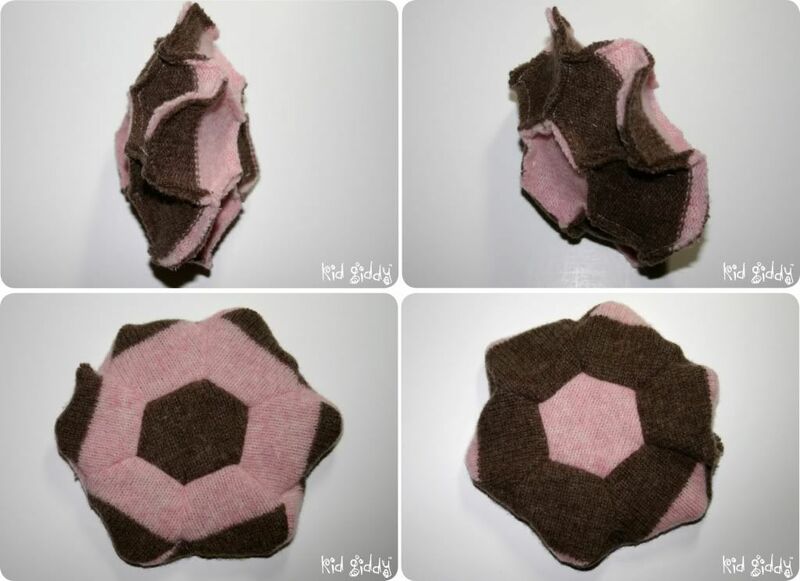 Place one piece of the wool fabric onto the hexagon die, of the size you are making. Cover it with the cutting mat. 6. Roll your cutting mat and die through the machine (be careful to watch your fingers), and roll it through to the other side. (TIP: If your AccuQuilt machine/die & mat are all brand new, like mine; or you are working with a thick fabric, start with only one layer at a time and build up your layers, as possible.) 7. Remove the cut fabric from the cutting mat (reminds me of Flat Stanley!) 8. 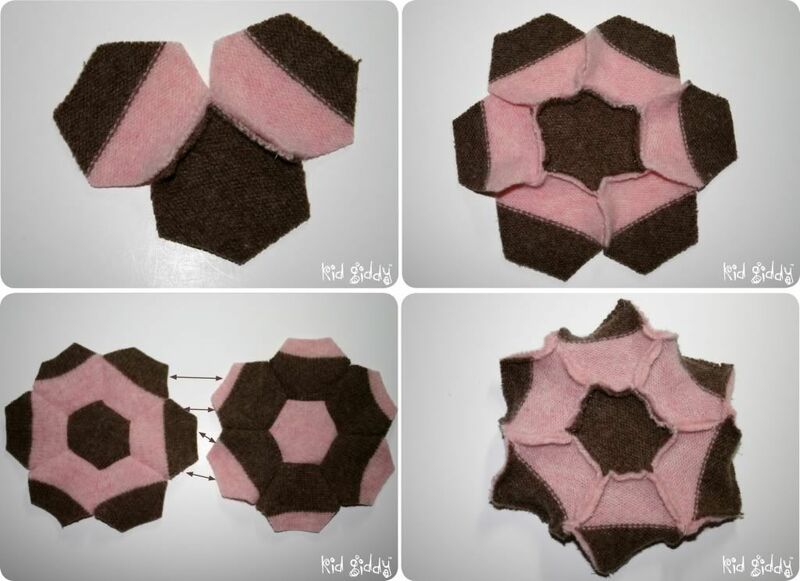 Cut enough to make a ball (14 pieces) or cut extras so you can choose which pieces you want to use, to create your pattern, as I did (fussy cutting). This sweater can easily make 2 balls, a 3" and a 5". 9. Begin with your center piece. Sew one piece, to the center piece, with right sides facing together. 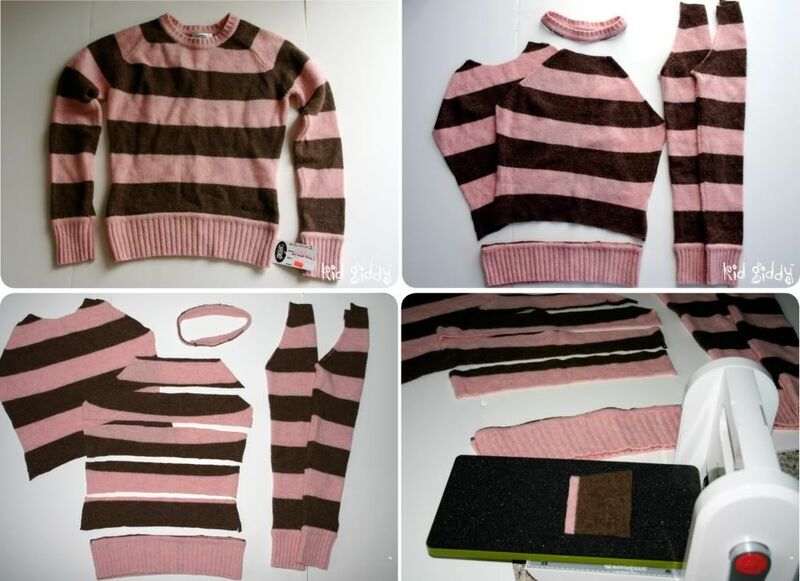 (TIP: There is a right side and wrong side to every sweater. Make sure you always have right sides facing) On each piece you will not be sewing from edge to edge, or it will not line up to the next one. You must start with 1/4" unsewn at the corner, sew along the edge, and then stop again, so you have 1/4" remaining on the opposite corner. 10. 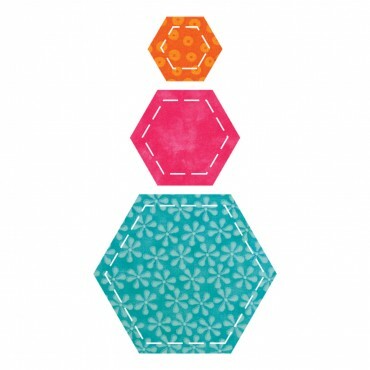 Continue to sew a piece, along each edge, all the way around the center hexagon. Then, sew each of the edges from the center piece down the edges, using the same 1/4" rule left open at the corner. 11. After you have made both the front and the back, you can begin to connect them. You must connect them as the arrows direct. You will not be connecting the top edge of one hexagon to the top edge of the other half, but rather connecting them at an angle. 12. The results will be a flower looking piece, that will in no way resemble a ball. 17. Begin by getting it wet with hot water. If the hot water bothers your hands, use gloves, or just wash it with a load of laundry on the hot (and non-delicate) cycle! 18. 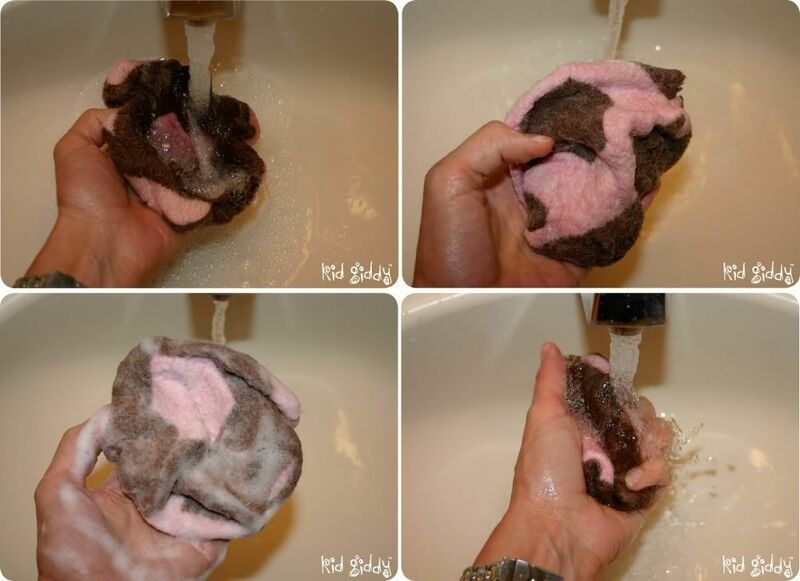 Place soap on your hands (be generous), and slowly work the soap into a strong lather. Rub the wool gently at first, and in a circular motion. 19. As you work the wool for a few minutes, you can then press a little harder and move a little quicker. Every once in a while splash it with some hot water and work it harder. This process should take a good 10 minutes. 20. Rinse it with cold water and then do it all over again. Once you have finished, rinse it very well and be sure when squeezed, there is no soap remaining. 21. When you are finished squeezing out as much of the water as you can, you'll notice the fibers are much tighter and closer together. If this did not happen, try the felting steps again. If it doesn't appear shrunken, there may be other non-wool fibers woven with the wool, in which case it won't work as well. 22. If it worked, place the ball in the dryer (with other items so you don't over heat your dryer), and dry it for about 40 minutes, or until dry! 23. If you place the ball next to one of your left over pieces, you'll see the difference in the fiber weave, and in the size. 24. Now through the opening, generously stuff your ball with your choice of fiberfill. I do prefer a premium blend to prevent bunching. 25. And stitch closed with a needle and thread (step not shown)! 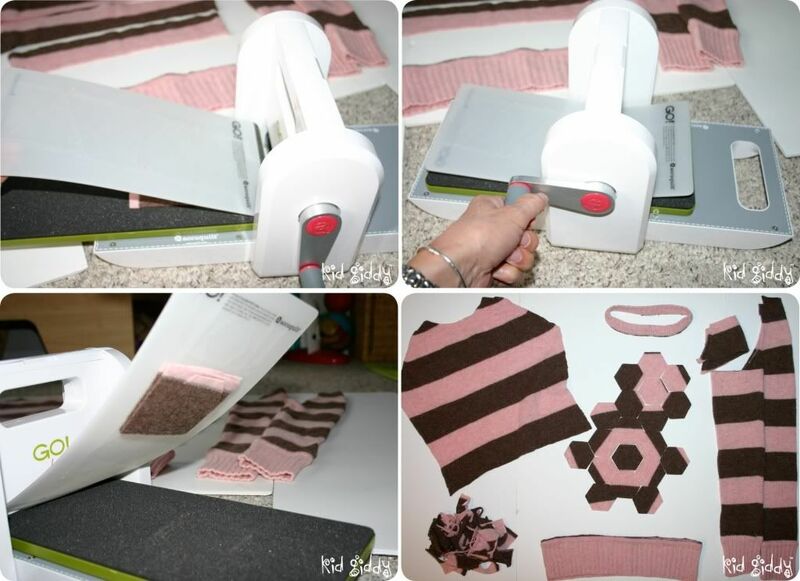 I love the AccuQuilt GO!, and think it has more uses for us crafters than meets the eye! I'm so excited for the other tutorials I'm working on for you...so stay tuned for more fun, AccuQuilt Tutorials coming soon! Oh and did I mention, an awesome AccuQuilt GO! Baby giveaway with 3 Dies of your choice too!! Whootwhoot! 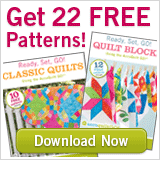 In the meantime, you can sign up for 22 FREE AccuQuilt Patterns - click the image to the right (on the sidebar) for your free patterns and download them today - it's really that easy!! Thanks for stopping by and checking out my tutorial! I hope that you make a ball or two, and when you do, I hope you come by and let me know, and also upload them to my Kid Giddy Flickr Group! I just recently started the group, so I'm needing more company! If you've made something using one of my designs, or tutorials, please post it to the group! Have a wonderful day & week! Disclaimer: I have not been paid by AccuQuilt to design this tutorial, but I have been given some products listed, in order to make it. This does not, in any way, alter my opinions of the product being used.